A group of high school students mentored by the San Diego County District Attorney’s Office unveiled Tuesday a mobile phone app they designed to inspire youth to make good choices. As part of their participation in the District Attorney’s Youth Advisory Board, students at e3 Civic High researched and designed the app to address issues faced by young people, such as addiction, crime, education and peer pressure. The students chose an app platform so the outreach would be accessible and appealing to their peers, and because it is an easy way for students to learn about the consequences of their choices. The LifeMap app — a game about choices — was born out of a discussion in 2016, when students on the Youth Advisory Board at e3 Civic High began examining quality of life and educational issues they saw in their communities. 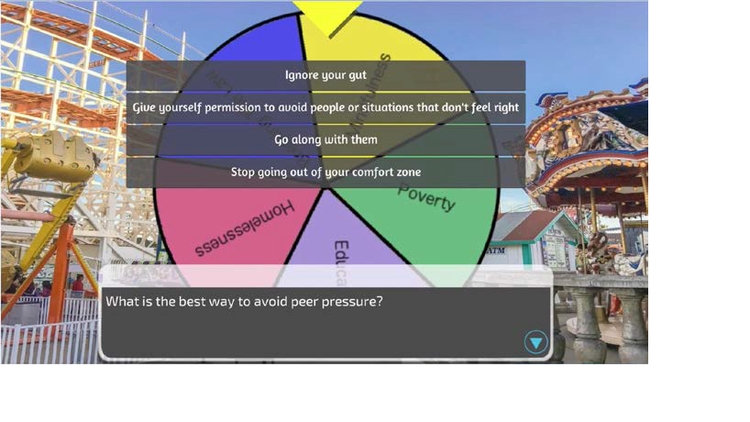 Players in the game are given the option to make choices based on five scenarios involving issues such as dropping out of high school, graffiti tagging and poverty. The game takes the player through various trolley stops through downtown, Barrio Logan and Belmont Park. Students designed and created the app with assistance from the Art Institute of California San Diego campus, which assisted with computer programming. It is currently available on Apple and Android mobile devices by searching Life Map DAYAB. The students unveiled the mobile app at e3 Civic High in downtown San Diego, along with the school’s administration, faculty and parents.